Mercedes-Benz reveals their highly anticipated C63 AMG Black Series Coupe. The wait is finally over. A new AMG Black Series has arrived. Featuring the signature widebody styling, the new C63 AMG Black Series Coupe generates its power from an AMG 6.3-liter naturally aspirated V8 producing 510hp and 457 lb-ft of torque, giving it a 0 to 62 mph time of just 4.2 seconds. It&apos;s mated to a modified AMG Speedshift MCT seven-speed sport gearbox. The car also weighs less than the standard C63 Coupe on which it&apos;s based on and sits lower than the base C63 AMG. To help prevent engine overheating, engineers added 50 percent to the cooling surface of the oil cooler by using components from the SLS AMG. 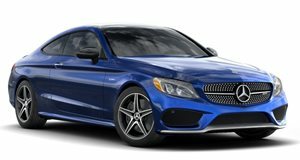 Additionally, it has a coilover sports suspension with the option of an AMG Track Package that includes active rear-axle transmission, cooling, and sport tires. There&apos;s also an AMG Aerodynamics package that attaches a front splitter and adjustable rear carbon aerofoil. The exterior features a front end with large air intakes and a hood which boasts a pair of air intake vents. Air openings are also visible in front of the rear wheels for more efficient cooling. The body kit is composed of lightweight carbon fiber and 19-inch titanium gray wheels round out the styling. The interior contains a pair of AMG sport bucket leather seats that have been upholstered in black Dinamica microfiber down the center. The door panels feature a new type of synthetic fiber while the rear seats have been removed completely to reduce weight. There&apos;s also an option to get two additional AMG sport seats in the rear. Final pricing has not been released just yet, but we&apos;re expecting it to easily begin at around $90,000.